These findings are described in the article entitled Use of high-resolution metabolomics for the identification of metabolic signals associated with traffic-related air pollution, recently published in the journal Environment International (Environment International 120 (2018) 145-154). This work was conducted by Donghai Liang, Tianwei Yu, Chandresh N. Ladva, Douglas I. Walker, Stefanie Ebelt Sarnat, Howard H. Chang, Dean P. Jones, and Jeremy A.Sarnat from Emory University, Jennifer L. Moutinho and Armistead G. Russell from the Georgia Institute of Technology, Rachel Golan from the Ben-Gurion University of the Negev, Megan Niedzwiecki from the Icahn School of Medicine at Mount Sinai, and Howard H. Chang and Roby Greenwald from the Georgia State University School of Public Health. Funding was provided by Health Effects Institute and the HERCULES exposome research center, supported by the National Institute of Environmental Health Sciences of the National Institutes of Health (P30ES019776). Due to the fast development of urbanization and the increasing number of vehicles on the road, traffic emissions has become one of the major sources for ambient pollution everywhere around the globe. In the United States, where traffic emissions account for around a quarter of the ambient air pollution, more than 45 million residents live within 100 meters of a four-lane highway. Accurately assessing exposures to traffic-related pollution is particularly critical, given the abundance of observational and controlled studies reporting associations between traffic sources and numerous adverse health effects. However, measuring internal, biologically-relevant exposures and corresponding health effects associated with traffic emissions remain very challenging, due to the individual susceptibility, impact of the pre-existing condition, and complexity of numerous endogenous pathways that may mediate the responses. In particular, the specific biological factors and pathways, as well as how they respond upon exposure to traffic pollution mixture are poorly understood. With the advancement in the omics-based technologies, high-resolution mass spectrometry coupled with liquid chromatography, an analytical platform capable of quantifying thousands of exogenous toxicants and endogenous metabolites, has emerged as a powerful tool to improve internal exposure estimation to complex environmental mixtures. To test whether high-resolution metabolomics can identify specific metabolic indicators of primary traffic pollution with sufficient sensitivity and robust signals, a research team led by scientists from Emory University conducted the Dorm Room Inhalation to Vehicle Emission (DRIVE) study, an intensive 12-week filed study that focused on assessing a complete emission-to-exposure pathway of primary traffic pollution. During the DRIVE study period, a suite of traffic-related pollutants was measured at multiple ambient and indoor sites at varying distances from a major highway artery. In parallel, 54 college students living in dormitories near (20 m) or far (1.4 km) from the highway contributed weekly plasma and saliva samples. Untargeted Metabolome-Wide Association Study (MWAS) workflow, where metabolic profiles were analyzed without prior knowledge of their chemical identity, was applied to assess associations between metabolic feature intensity (i.e., relative concentration) and levels of traffic-related pollutants. Finally, comprehensive pathway analysis and chemical validation were conducted to identify specific metabolic patterns and to further investigate potentially biologically relevant indicators to primary traffic exposures. The study reported that 1,291 unique metabolic features were significantly associated with at least one or more traffic indicator, including black carbon, carbon monoxide, nitrogen oxides, and fine particulate matter, after controlling for confounding and false discovery rate. 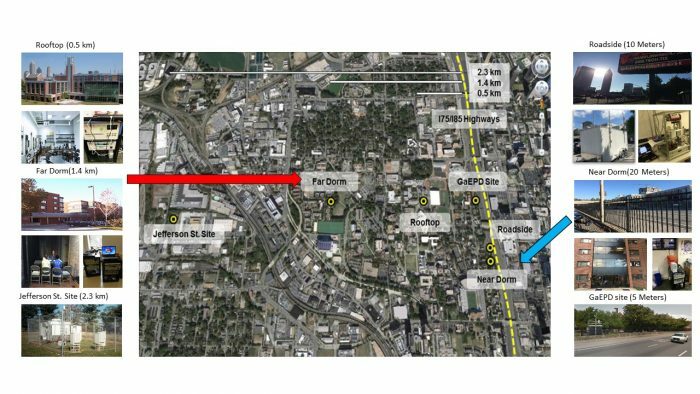 Pathway analysis of metabolic features associated with traffic exposure indicated elicitation of inflammatory and oxidative stress-related pathways, including leukotriene and vitamin E metabolism. In addition, chemical identities of 10 metabolites associated with traffic pollutants were confirmed, including arginine, histidine, γ-linolenic acid, and hypoxanthine. The results from this study further support high-resolution metabolomics as a powerful platform for elucidating biologically relevant pathways associated with exposures to key environmental pollutants and sources. Observed response was consistent with endogenous metabolic signaling related to oxidative stress, inflammation, and nucleic acid damage and repair. 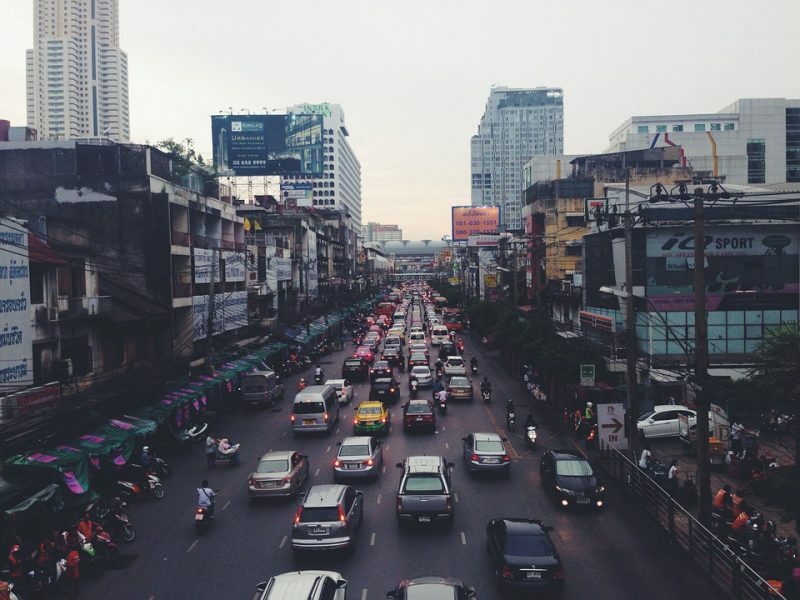 Collectively, the current findings in this study provide support for the use of untargeted high-resolution metabolomics in the development of metabolic biomarkers of traffic pollution exposure and response. While highly intriguing, these findings warrant replication to solidify their use as novel, specific indicators of exposure and response to this critical source of urban air pollution. Donghai Liang currently works as a Research Assistant Professor at the Department of Environmental and Occupational Health, Emory University. His current research focuses on health effects associated with ambient and traffic-related air pollution using exposure assessment and high-resolution metabolomics.